POYNT POS – The world’s first smart terminal that has created a standard for an impeccable payments experience for merchants and customers. POYNT POS is available on any android device or on POYNT’S smart terminal, as its preferred register option. Available for merchants of any size, business owners can now accept EMV credit cards, magnetic swipes, NFC payments (such as Apple Pay®, Samsung Pay, Google Wallet) and cash transactions. 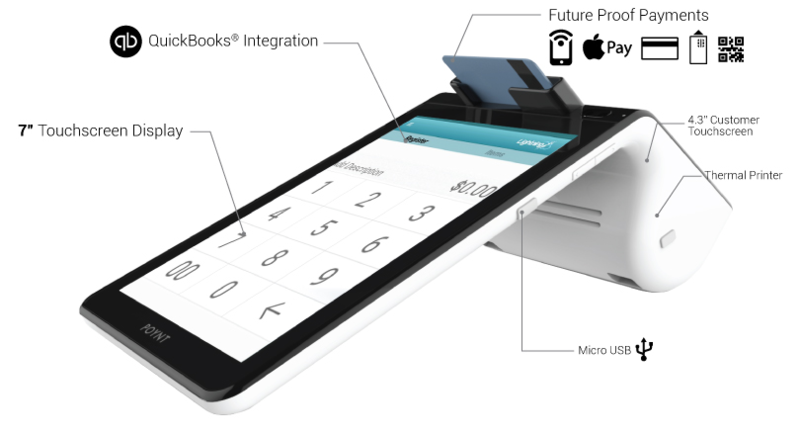 Additionally, POYNT POS includes easy to use yet powerful tools needed to Manage Inventory, Reports, Built In EMV And NFC Technology, Connects with 3G, WiFi or Both, Built-In Receipt Printer and Pay-At-Table ready.